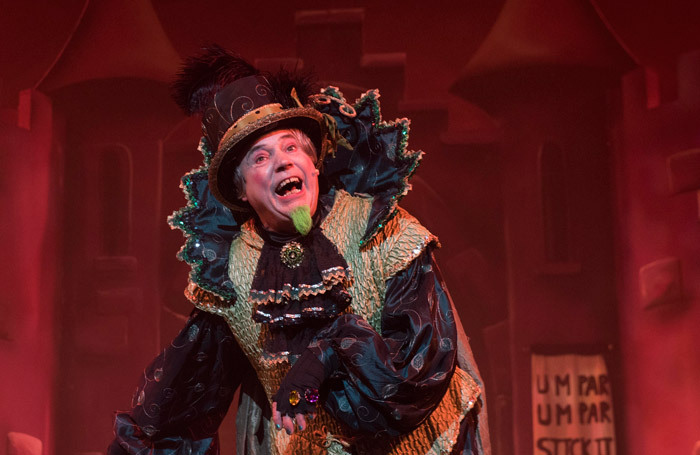 Pantomime at Mansfield’s Palace Theatre is keenly awaited and much loved seasonal treat. This year there’s a big welcome for returning favourite, Adam Moss, as Simple Simon. The man is a whirlwind, unleashing his energies and his gags at 100mph. The whole show is almost mercilessly cheerful and even the sign language interpreter gets a custard pie. It’s got all the right ingredients and they’ve pushed the boat out with a Giant Blunderbore who gets up close with his mace and chain in some thrilling 3D. Mark Little is a grumpy Fleshcreep, Craig Ansell a solid Dame and Rebecca Wheatley a kindly and eccentric Fairy. Beanstalk Wonderland, the finale to Act I, is one of several well choreographed numbers. But it’s all very much of a muchness this year. Every character is played larger than life, full-on for the whole of the time. That has an engaging directness about it but it eliminates any light and shade in the story. There’s never any doubt that Daisy the Cow will survive or that Princess Jill will escape or that the Giant will be defeated. It’s a long show at well over two and half hours and this is not quite sustainable.